Left: Princess Gouramma of Coorg, 1855-6, polychrome marble, 68 x 38 x 24cm, Durbar corridor, Osborne, Royal Collection Trust, RCIN 41535. © Her Majesty Queen Elizabeth II 2018. Right: Maharajah Duleep Singh, 1856, polychrome marble, 80.6 x 47 x 28.5cm, Private collection [background digitally removed — JB]. The two busts mentioned by are those of Queen Victoria's goddaughter and protégé, Princess Gouramma of Coorg, 1855-6 (RCIN 41535) and Maharajah Duleep Singh, 1856. In the early spring 1856, while Janet Duff Gordon was sitting for Baron Marochetti for his Monument to Princess Elizabeth), the watercolourist William Henry Millais "was tinting marble busts in the studio.... A bust of the Princess of Coorg had just been painted, and it was amusing to hear the remarks of visitors through the half-open door. Many thought it like Mme Tussaud, others liked it" (Ross 39-40). William's brother John Everett Millais was among Marochetti's admirers: "His coloured marble busts are magnificent beyond everything," he wrote to his wife on 8 May 1856 (300). 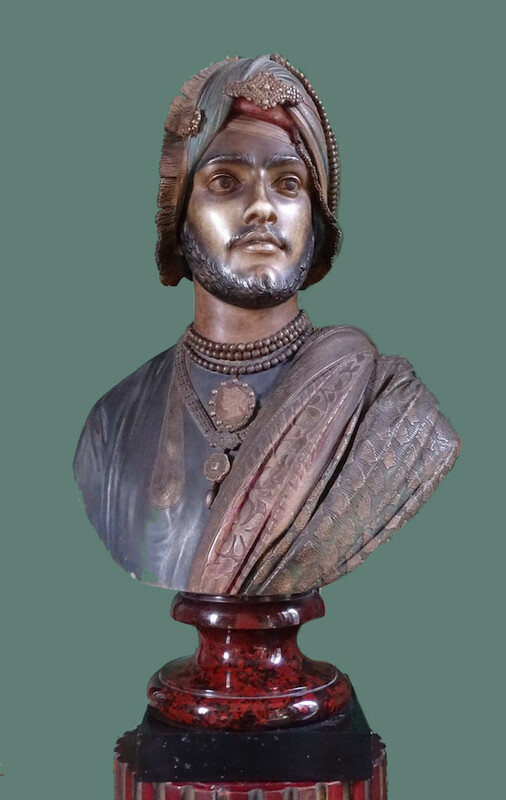 Queen Victoria, however, did not like the colouring of the Maharajah's bust — so much so that she recorded in her Journal (26 August 1856) that it had been "entirely spoilt, by being coloured" and ordered a new version from the sculptor, in white marble (RCIN 41542; see Marsden 163). It was proving, in fact, to be controversial, with influential members of the art world speaking for and against it. Henry Weekes, for example, had seen the coloured bust, which finally remained in Marochetti's possession. In his lecture on "Colour in Sculpture" delivered at the Royal Academy, although he confessed to not being an advocate for the application of colour to sculpture, Weekes praised Marochetti's "admirable bust of His Highness Duleep Singh," acknowledging that, in this case, colour was "a necessary adjunct to render the effect of the whole complete" (Weekes 165). The Critic too appreciated the bust: "Above all the eyes, usually the weak point in an uncoloured bust, are strikingly beautiful; the face is living and breathing, and nothing of the much-dreaded waxwork effect appears" (1 May 1856: 22; on the "much-dreaded waxwork effect," see Alison Yarrington, "Under the spell of Madame Tussaud" in Blühm 83-92). I hear of a particular instance in which he [Marochetti] has brought the question to the experimentum crucis, by colouring a figure of an Indian woman au naturel. The result is said to be extremely beautiful.... Gibson also is reported to be doing work "in which a tinge of pink is given to the cheek, a tinge of blue to the eye, and a tinge of auburn to the hair." But this, if this is all, has not the boldness of Marochetti's experiment. [The Crayon, 88]. An interesting extract of a Victorian diary, dated 6 July 1856, reveals Gibson's own opinion of Marochetti's polychromy: "Gibson called.... He is as keen as ever after his hobby of coloured (or rather tinted) statues, and talked a good deal on the subject. He objects, however, to the manner in which Marochetti has coloured some statues, so as to have the real colouring and appearance of life" (Bunbury 426). This echoes Henry Greville's letter to Frederic Leighton and confirms, if necessary, that both sculptors, at the same time, were equally involved in the polychrome issue, although expressing themselves in different ways. Both coloured marble busts were exhibited together for the first time at the Artist and Empire, Facing Britain's Imperial Past exhibition at Tate Britain London, which ran from 25 November 2015 – 10 April 2016. Marochetti's bust of Duleep/Dalip Singh will next be displayed at the Musée d'Orsay in an exhibition entitled: In colour: Polychrome sculpture in France, 1850-1910, 12 June – 9 September 2018. Duleep Singh's bust and the polychrome plaster model of Princess Gouramma's were both officially listed by the French State on 24 January 2002. Unfortunately, these two marble busts by Marochetti, now considered to be "a true revolution in portraiture" (Blühm: 34-35), are his only surviving coloured sculptures: others are untraced, or else their colour has faded over the years and can no longer be seen. 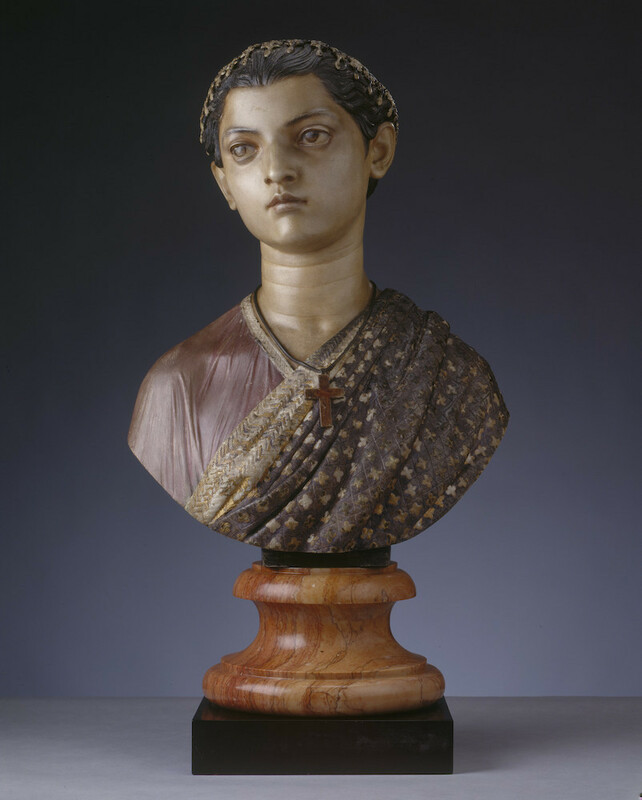 However, as rare survivals, these two have an even greater value, as predicted by The Times of 16 April 1856: "Hereafter it [the bust of the Princess of Coorg] will have a strange historical interest in the Royal Collection" (10). Queen Victoria, marble bust, 1855, Paris, Collections de la Ville de Paris. The hair and dress show traces of colour [background digitally removed — JB]. The Baron's work is full of talent, and is modelled brilliantly, as may be perceived in a moment by observing the beauty of the chiaro 'scuro which it presents from every point of view. Rarely, indeed, has a bust been modelled, the eye, nostril, and mouth of which appear more instinct with vital energy.... We cannot but regard the tinting of the marble, and the powdering with gold of the hair of Marochetti's bust, as puerilities, detracting from, rather than enhancing, the value of the work of art. The gold is an especial mistake; for, by its superior powers of reflecting light, it apparently raises the bottoms of the hollows in which it adheres to the same level as the adjoining raised surfaces – thus neutralizing the very effect of light and shade which the sculptor had sought by his drills and chisels to procure. [7 June 1857: 125]. The bust rests on a plinth of white marble, very prettily turned; and the flesh which it represents is very prettily coloured – brown. Now, here the Baron puzzles us.... As the plea for this colouring of statues, put forth on behalf of those who adopt the practice, is, we believe, imitation, does Baron Marochetti, by any strange misapprehension, take this to be the colour of Saxon flesh generally, or particularly of our liege lady the Queen? Why, when the thoughts of the sculptor should have been concentrated on his somewhat important work, were they running on Pocahontas? It is very likely that Hogg was alluding to the Princess of Coorg, whose bust he had certainly heard of, and probably seen. He went further in speaking of "lèse-majesté" and "colour offence" and, after a long indictment of coloured sculpture, which he had denounced as "an art heresy," went on: "In the present case... the colour helps... the effect of picture, and may be taken as an added prettiness. The whole work makes a pretty picture – of a child" (295-96). This strong accusation is out of proportion to the colouring of Queen Victoria's bust, considering that other critics had not even mentioned it. On the pretext that it was a "brown" bust, Hogg could express his xenophobic rejection of "a Sardinian" whose work contrasted with that of "a native sculptor, Mr J. Durham," content with "pure white marble." The polychrome debate was thus turning into a racial issue: "brown" against "pure white." Did Marochetti use coffee to colour the bust, as suggested by the Illustrated London News? Or dirty water as Canova occasionally did (Honour 219)? Whatever process he used, he probably did the same with another bust, as mentioned in a letter Marochetti sent to the French Ambassador in England, Mr de Persigny. The Ambassador's wife was sitting for the sculptor in March 1856 when he was working on Duleep Singh's bust: "I have lightly tinted the bust of Mrs de Persigny" ("J'ai donné une légère teinte au buste de Mme de Persigny," AN 44AP/12). 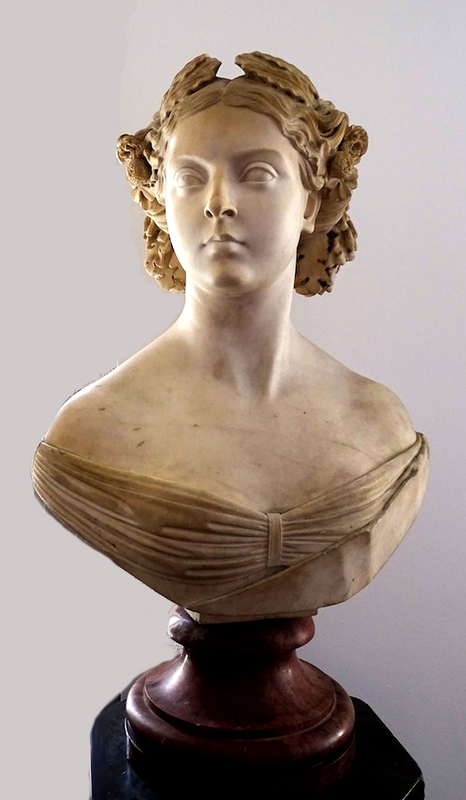 Among the three busts of the Queen by Marochetti, the one which has been exhibited at the Royal Academy is likely to be the bust Queen Victoria presented to the Prefect of the Seine — the famous Baron Haussmann - in 1856, to commemorate her visit to the Paris International Exhibition in 1855. The bust today belongs to the Collections of the Ville de Paris.